Have you ever dream of riding on a cable car in the best hill stations of India? If yes, then we have got something for you. It is the dream of every person to enjoy their life to the fullest. It is actually justified as well. No one thinks about adventure without an adventurous activity. Just answer a simple question. What is best to see the whole city covered by beautiful mountains? Without a shadow of a doubt, ropeways are the best thing to do such a great adventure. 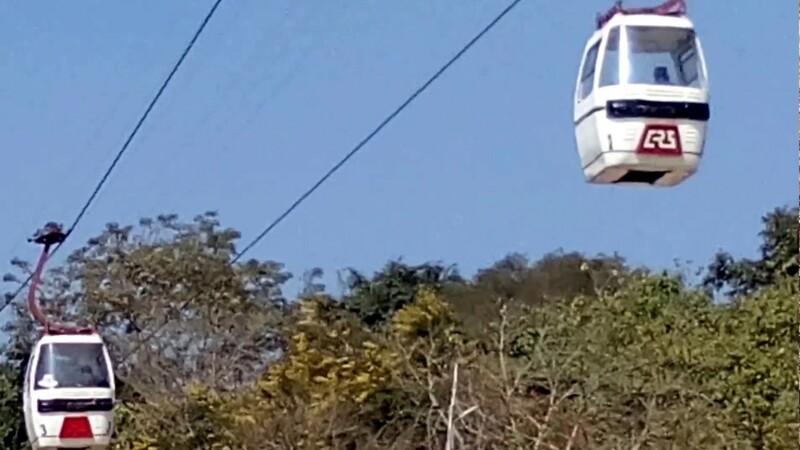 In India, there is so many No doubt there are may visit places and hill stations and in many of them, the cable car system has been installed. Ropeways are best to get bird’s eye view of a hill station. Today we have come up with a list of ropeways which are installed in different parts of India. So here is our compiled list of the best ropeways in India. Here is the first one on your platter. This is the parwanoo ropeway. It is also called as the timber trail. It is Himachal Pradesh but just around 35 kilometres from the beautiful city, Chandigarh. 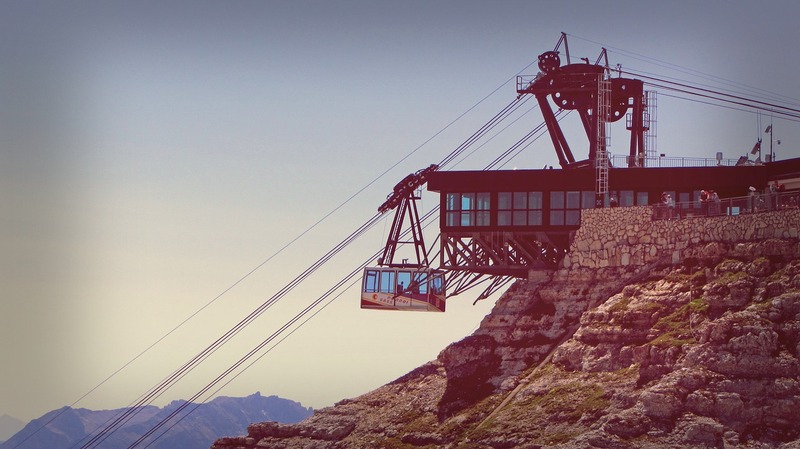 The ropeway is a very famous one and it is surrounded by stunning views all around it. The ropeway operates at the height of 5000 feet and that said it is also spread across the two mountain ranges around it. This is also known as one of the largest and longest ropeways in India. There is even a river between the two mountain ranges namely kaushalya river. So you can just imagine the view. It is just wonderful. Moreover, if you are visiting Amritsar then this place is surely not to miss. you can book a taxi from Amritsar to this beautiful Place at very minimal cost. So next time if you are around just keep this ropeway in your mind. It is a great place to visit. Another ropeway service in the state of Jammu and Kashmir. Vaishno Mata has considered a very holy place and every year a lot of pilgrims visit this place. Pilgrims reach the main Temple of Vaishno Mata but there is Bhairon temple around 2 kilometres above it. A lot of elderly pilgrims and pilgrims coming with children face difficulty in covering this distance. To eradicate this problem this project is starting. The cable car at the temple of Vaishno Mata will start from the manokamna temple and will take you to Bhairon temple in the whole process. This will assist pilgrims in the successful visit of Vaishno Mata temple without any hiccups. This ropeway is in Shimla town. The ropeway connects to the famous Jakhu temple. Riding in the cable car of this ropeway one can view really beautiful mountain ranges especially the views of the Himalayan hills are breathtaking. You will ebullient by seeing the beautiful forests from the ropeway. Next ropeway is one of those that will just win your heart. The next one is the Manali ropeway in a state called as ‘devbhoomi’ as well, Himachal Pradesh. The ropeway is situated just 15 kilometres from Manali in the beautiful Solang valley. Just ask any person who has visited solang valley. You will be just thrilled by the experience they will explain toi you. Such is the flamboyance of Solang valley. There are stunning views all around this ropeway in Solang valley. The ride in the cable car starts from Solang valley and it ends at Mt. Phatru. Surely this ropeway is not something which is to be missed. Moreover, there are so many other great places to visit in Manali. 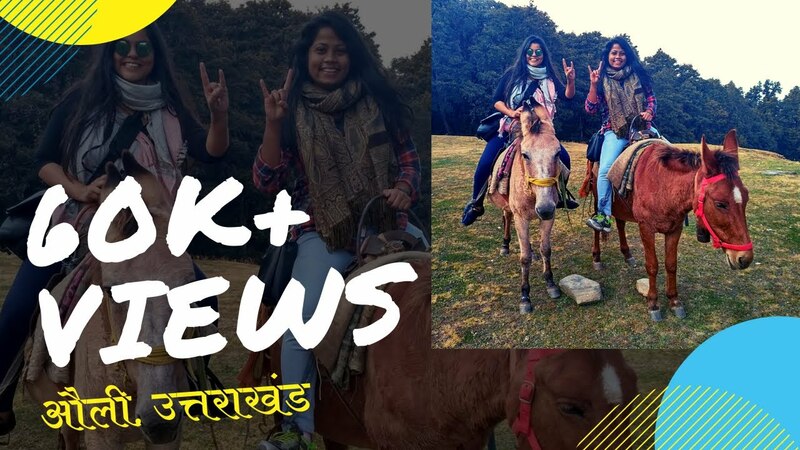 So just pack your bags and head towards Manali. This famous ropeway is in Uttarakhand state. You can take this cable car from the mall and it will end up at Gun hill which is at the height of around 2530 metres. 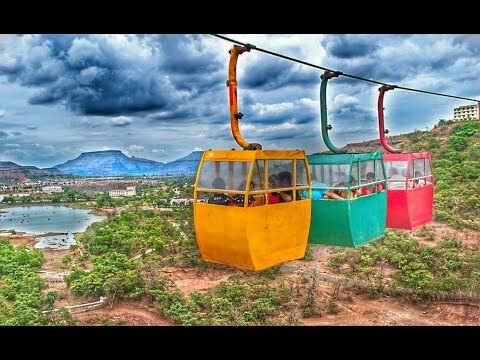 This ropeway will make you thrilled as you will be surrounded all around the mountains and the cable ride will offer really great views of beautiful peaks all around which includes the famous bandarpunch as well. The charges of this cable ride are also very minimal as well. The best time to ride in this cable car is before sunset as you can enjoy beautiful scenes of the sunset from ropeway as well. So there are no worries. Just get into the cable car and enjoy magnificent views all around you. Surrounded by beautiful hills all around this ropeway is one of the best in the state of Himachal Pradesh. This ropeway is built at the famous Naina Devi temple. The Naina Devi temple is just around 22 kilometres from another famous pilgrimage Anandpur Sahib. This ropeway is a very beautiful one and the pilgrims who visit Naina Devi temple take a ride on this ropeway and enjoy themselves. Welcome to the heavenly state of India, Jammu and Kashmir. Gulmarg gondola is Asia’s largest ropeway project. The ropeway service at Gulmarg gondola works in two stages. In the first stage, the ropeway connects from Gulmarg resort to kongdori station which is in the kongdori valley. 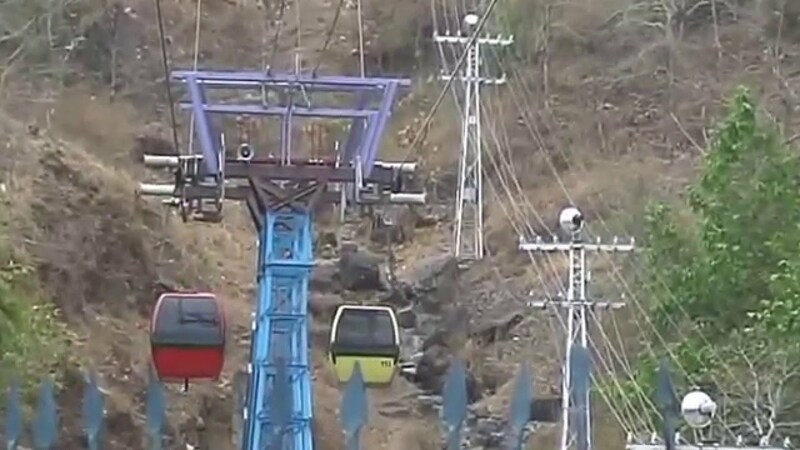 In the second stage, the cable car connects the people in the car from kongdori station to apparwath peak which is the end destination of this ropeway. This ropeway experience is once in a lifetime experience. The views are just stunning. Nothing can match the great experience of this ropeway. Moreover, the prices of the ropeway service are quite reasonable as well. Another very famous and wonderful ropeway in the state of Uttarakhand. The length of this cable car in Auli is around 4 kilometres. This Auli ropeway starts from Auli and goes to Joshimath. In the whole journey of around 15 minutes, you will get to see wonderful views of the great Himalayas. Other great attraction besides ropeway is off skiing. You can enjoy skiing as well. It would be ideal to visit this ropeway once in a life. The ride will make you refreshed. It is roadway in the state of Madhya Pradesh. A quite wonderful ropeway to take a ride in as it offers a great view of the Dhuandhaar waterfall. The ropeway is started in such a way that the cable ride is stretching along the waterfall. The length of this ropeway is around 1140 metres. The cost of the cable car is very reasonable. Make sure to make a trip to this ropeway. Darjeeling is a wonderful place to visit. 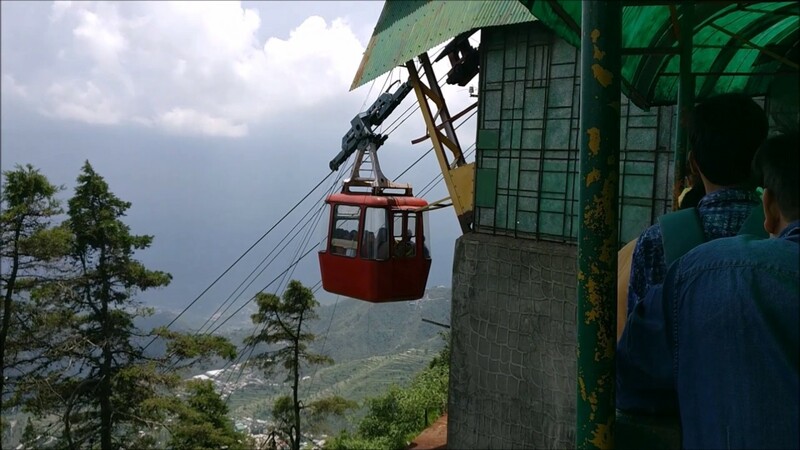 This ropeway is a great attraction in Darjeeling. The ropeway is also called Rangeet valley cable car project. The pathway of the ropeway is between Singamari and Singla bazaar. The ropeway starts at the height of 7000 feet and ends at the height of 800 feet. Another important thing is that these days total of 16 cable cars operate under this ropeway service. In the whole journey of cable car, you will witness lush green forests, beautiful mountain ranges, a majestic waterfall and so many other things. It is really exciting to just talk about this ropeway. Experience would be just unbelievable. 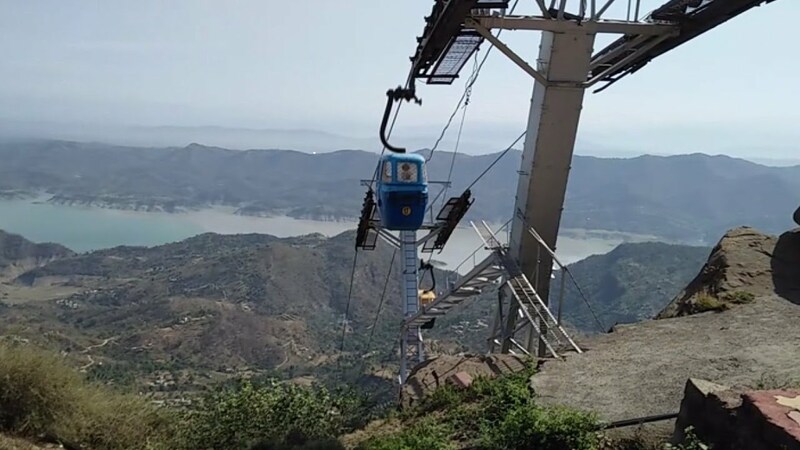 Another ropeway in the state of Madhya Pradesh. The ropeway was set up to help the elderly people in reaching the famous Hindu holy shrine, Maihar Devi temple. That is why ropeway is named the same after the name of the temple. The Maihar Devi temple is situated in the trikuta hill and before the ropeway was set up, pilgrims had to climb a lot of steps to reach the temple. But with the installation of the ropeway, this problem has been solved. Moreover one has to pay very less amount to get a ride in this cable car. 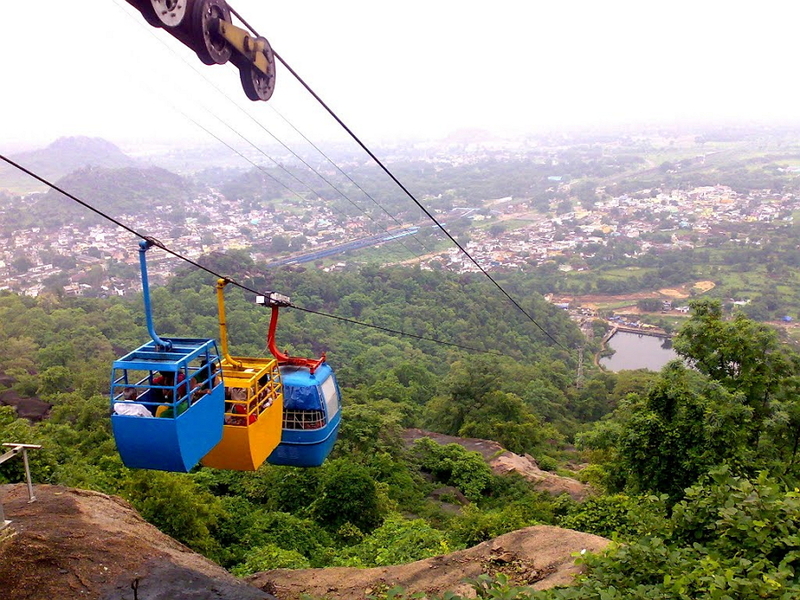 Salkanpur ropeway is another ropeway installed in the state of Madhya Pradesh. The ropeway system installed here is the best way to reach the important Hindu temple that is Salkanpur Devi temple. 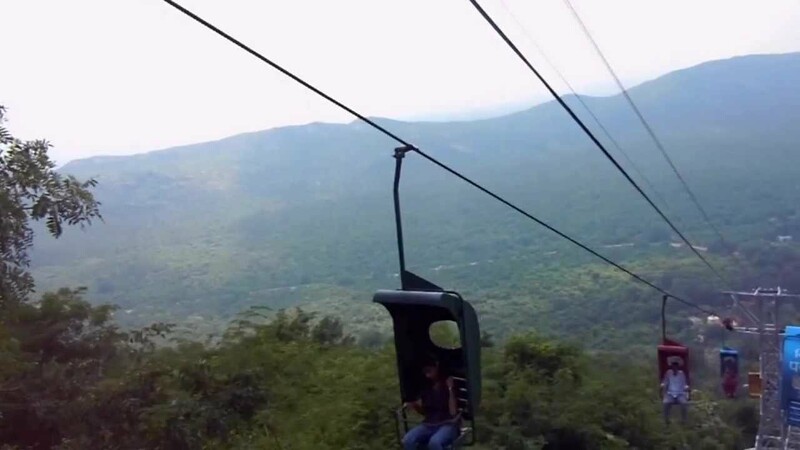 The ride of the ropeway here offers a great view of the lush green forest. Most importantly it has made the task of reaching the temple easy which is perched on a hillock. Another ropeway in the state of heavenly beauty, Uttarakhand. Mansa Devi temple is situated on the top of bilwa parvat which is on the Sivalik hills. This ropeway connects the pilgrims to the temple. The cable car ride offers a splendid view of the city. Uttarakhand is really beautiful and from the cable car it looks even more beautiful. It would be great to get a ride in this ropeway service cable car and visit the Mansa Devi temple. 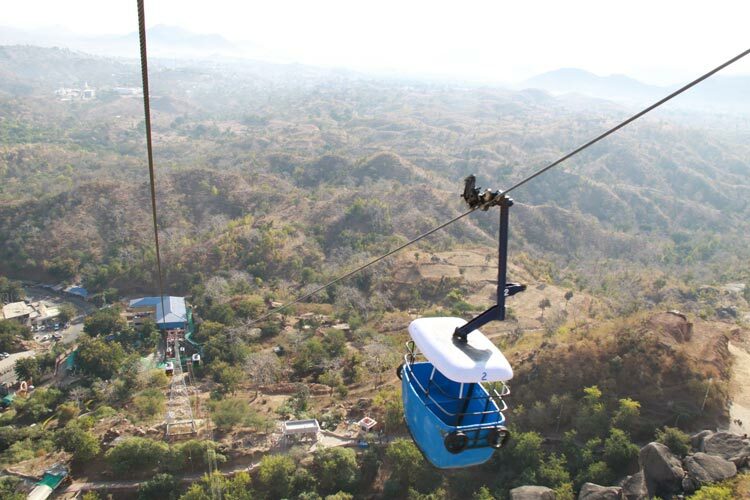 This ropeway is in the state of Gujarat. It is also famously known as the Maa Mahakali ka Udankhatola that is the flying object of the great Indian goddess, Mahakali. This ropeway is to reach the famous Kalimata temple in Pavagadh. In the absence of ropeway service, pilgrims need to climb a lot of stairs to reach the temple. This ropeway has made things easy for the pilgrims. The cable car takes the pilgrims from the base of the mountain to the temple in a very short period of time. 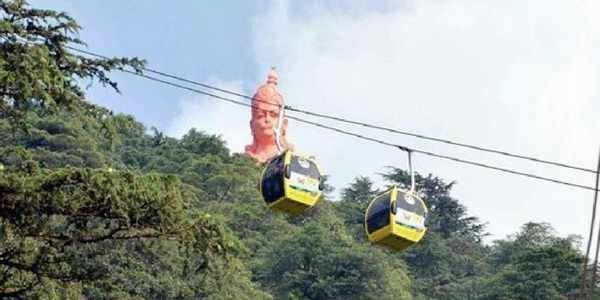 The ropeway is in the state of Uttarakhand. This ropeway is also known as Chandidevi Udankhatola. This ropeway connects to the Maa Chandi Devi Temple which is in Haridwar. The ropeway starts at the base of the hill and the tickets are available there and take you to the temple. You can take combo ticket as well if you want to make the trip to both Chandi Devi Temple and Mansa Devi temple. The prices of the tickets are quite reasonable as well. The ropeway is in Rajasthan state. The ropeway is also famously known as Udaipur ropeway. This ropeway is also for the convenience of the pilgrims who come to visit Karni Mata temple. Karni Mata temple is a famous temple in Udaipur and the ropeway connects Karni Mata temple with Doodh Talai. 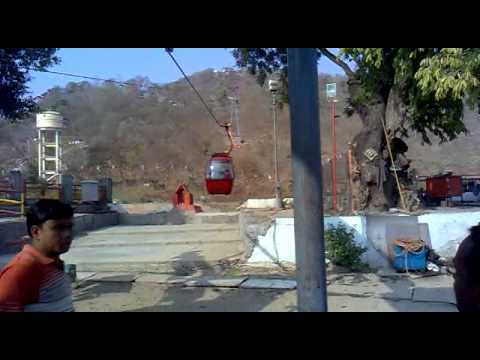 The tourists coming to Karni Mata temple get a lot of help because of this ropeway. 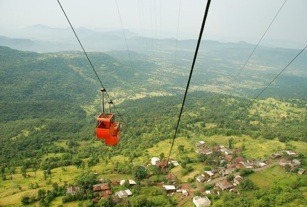 The ropeway in Maharashtra state. This ropeway service is similarly for the convenience of the pilgrims visiting Jivadani temple in Virar in Maharashtra state. The temple is in the north Mumbai region. The temple is perhed on one of the hills of the famous Satpura range. This ropeway helps the pilgrims in reaching temple easily and very quickly. The prices of the tickets of ropeway service are also quite reasonable for making things even more comfortable for the pilgrims. The ropeway is in Gujarat state. The ropeway service offers a comfortable and easy ride to the famous goddess Durga temple. The cable cars of the ropeway service operate between Girl temple and the ambaji temple. That is why the name of the ropeway is also named after ambaji temple. The ride of cable car offers a great view of different mountain ranges all around. The ropeway is in Jharkhand state. The ropeway is operating at the trikuta hills. The ropeway is also known as Gagan khatola where Gagan means sky and khatola means flying object. The cable car takes the riders from the base of trikut to the top of the range and then brings the back. The prices of the tickets are very reasonable. Also currently around 25 operate under this ropeway service. 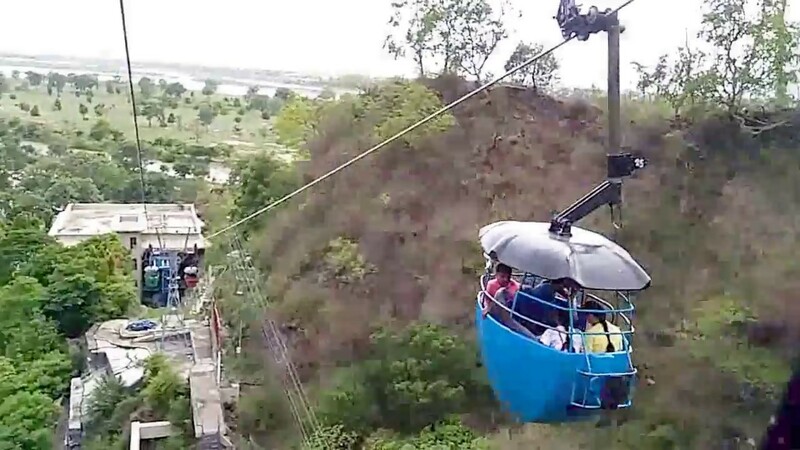 Another ropeway in the Gujarat state. The ropeway is the dang district. The ropeway basically connects the governor’s hill with the base of the mountain. The ride of the trip is around 15 minutes. The ropeway starts from the variety resort and goes to sunset point. The whole ride offers a great view of saputara. The ropeway is in Chhattisgarh state. This ropeway is also for the convenience of the pilgrims who wish to visit Maa bambleshwari temple. The temple is at a hilltop in rajnandgoan district. 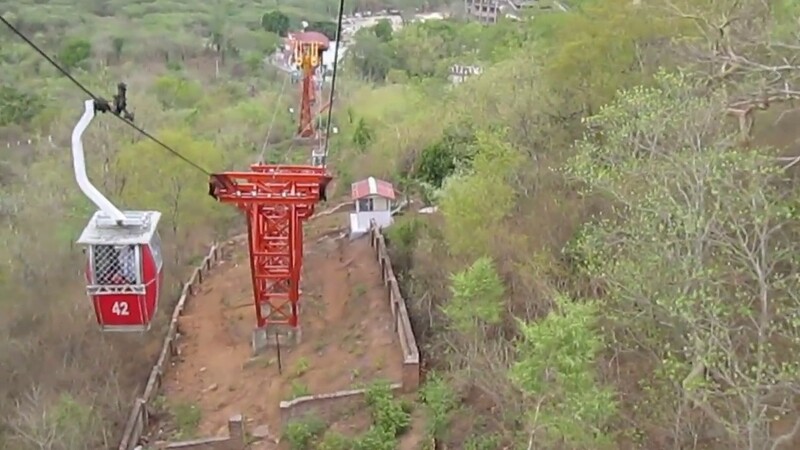 This is the only ropeway system set up in the Chhattisgarh state. The views from the cable car are quite magnificent and people like them a lot. This is known famously as Malampuzha Udankhatola. The ropeway is in Kerala state. It is in the Malampuzha gardens. There are around 64 cable cars which are two-seaters operating under this ropeway service. The ropeway service takes riders to a height of around 60 feet in very short period of time. The ride offers enthralling views of the gardens and the reservoirs. The ropeway is in Tamil Nadu state. 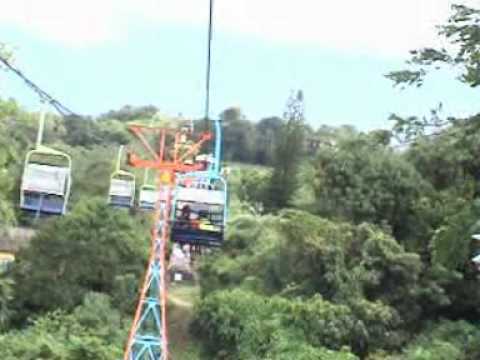 The ropeway is a major tourist attraction in Ooty. The length of the ropeway is around 3 kilometers. The ropeway starts from a power house in singara. One taking the ride will love the beautiful views of tea estates. The ride on the ropeway is of around one hour. 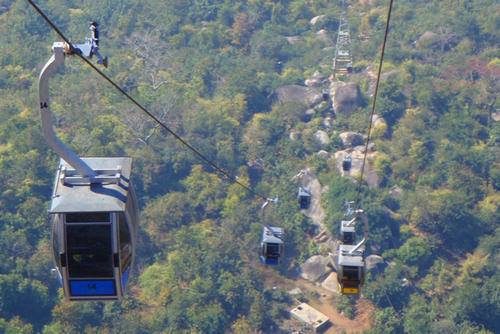 The ropeway is installed in Telangana state. Srisailam is a religious place and is famous for the Bhramaramba mallikarjunaswamy temple which is dedicated to Lord Shiva. The ropeway ride is a very short one but the views offered by the ride are really wonderful. The ropeway connects to the raigad fort which was chosen as his capital by Shivaji Maharaj. 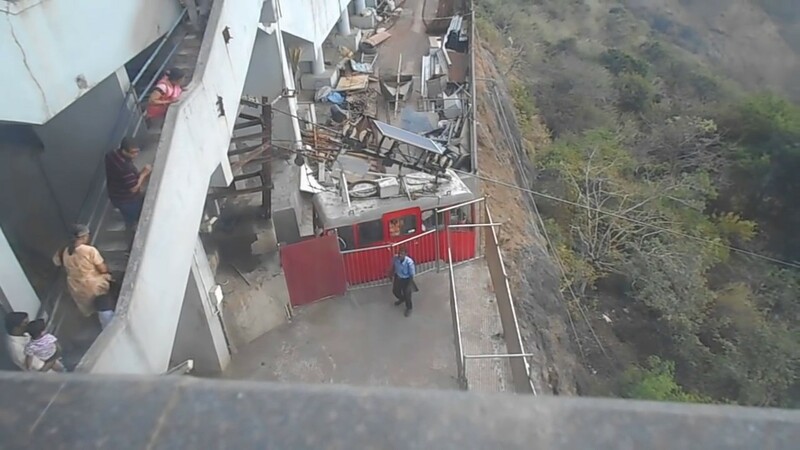 The ropeway is in Maharashtra state. The length of ropeway is around 760 metres. The prices of tickets are quite genuine for this ride. 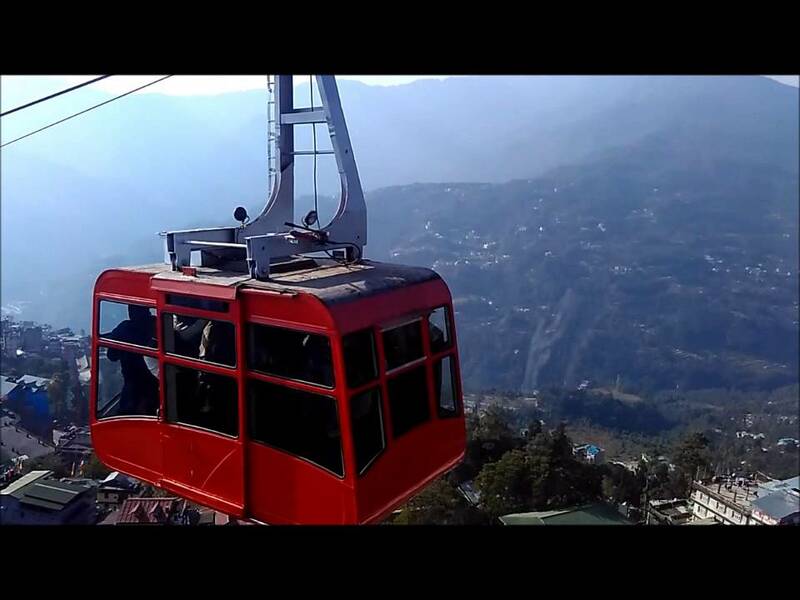 The ropeway is in Sikkim state. It is a great tourist attraction. The length of ropeway is around 1 kilometer and the ride offers stunning views all around. For example, there is a view of Kanchenjunga snow peak. The ropeway service starts from Deorali market and in the whole ride total of three stations come in between. The ropeway is in Bihar state. It is a single person ropeway that means the cable car on the ropeway is for one person only. It is a major tourist attraction. The ropeway runs to the top of Ratnagiri hill. So these are the some of the most ropeways installed in India. Every ropeway is unique in its own way and every ropeway offers a different experience. Travelling in a cable car in ropeway is a completely different experience and this experience is highly recommended from our side as well. So make a trip and reach out to your nearest ropeway and enjoy the beautiful ride and collect some really wonderful memories for yourself. So good luck with your ride.